Samsung has announced that its Smart View app is now ready to download for the Samsung Galaxy S2. 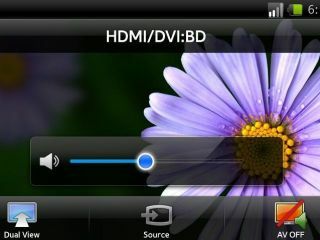 The app allows you to watch TV content on your Samsung Galaxy S2, once you link it up to the Samsung Smart TV D7000 and D8000 series. Samsung is no stranger to offering TV content through mobile devices. Last year it launched the Samsung Remote which allowed you to view the same TV show on your remote as was being shown on your Samsung TV. The idea was that you didn't have to pause the show – just watch it wherever you are in the house on the remote. With the launch of the new D7000 and D8000 series this idea has evolved into an app which will be available for a number of Samsung devices, but on the Galaxy S2 initially. Instead of having to watch the same thing, however, you can watch a completely separate channel through the app. "Samsung Smart TV is leading the 'smart revolution' not only with the features of Smart TV itself – such as rich content, 2D and 3D picture quality, smart functions and design – but also with input devices using our Qwerty smart remote control, the Samsung Remote app, and now with Smart View," said Guy Kinnell, Marketing Director for TV, Samsung UK. Although it is initially only available to Galaxy S2 users, the app will come to the Samsung Galaxy Tab 10.1 and Samsung Galaxy S later in the year. The app is available from the Android Market now.